Atomic-scale modeling of compacted nucleic acids has the ability to reveal the inner workings of spectacular biomolecular machines such as ribosomes or virus particles. Yet, the outcome of such modeling efforts sensitively depends on the accuracy of the underlying computational models. 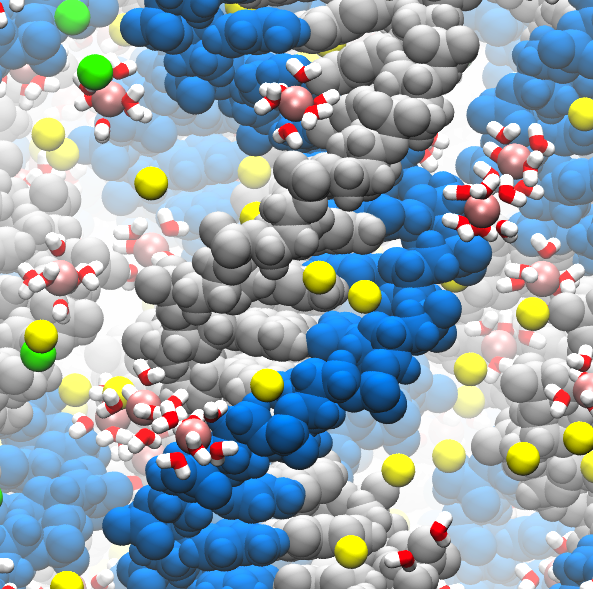 Our molecular dynamics simulations of an array of 64 parallel duplex DNA revealed considerable artifacts in the standard parametrization of cation-DNA phosphate interactions: both the DNA arrangement and the internal pressure inside the DNA arrays were found in considerable disagreement with experiment. To improve the model, we fine-tuned the parametrization of van der Waals interactions of specific ion pairs to reproduce experimental osmotic pressure of binary electrolyte solutions. Our reparametrization applied to the combinations of four cations (lithium, sodium, potassium and magnesium) and three anions (chloride, acetate and dimethylphosphate), for both CHARMM and AMBER parameter sets. Repeating the DNA array simulation using our reparametrization of ion-phosphate interaction produced results consistent with experiment. Our improved parametrization can be directly applied to molecular dynamics simulations of various charged biomolecular systems, including nucleic acids, proteins rich in aspartate and glutamate side chains and lipid bilayer membranes.